All his life, Grove Henry Johnson believed those words of Jesus: 'I am the living bread that came down from heaven. Whoever eats this bread will live forever. This bread is my flesh, which I will give for the life of the world.' Most of his life, Dr Johnson was a priest. Most of his life, he started his day sharing this bread of life with the world. He spent his childhood years here in Rocky, and he enjoyed his twilight years here. Rockhampton was home. Yet the cosmopolitan Grove was ever so much more at home in Rome, Paris or Sydney. And he meant that as no offence to the people of Rockhampton. As a priest, he mostly ministered here in the Rocky diocese. 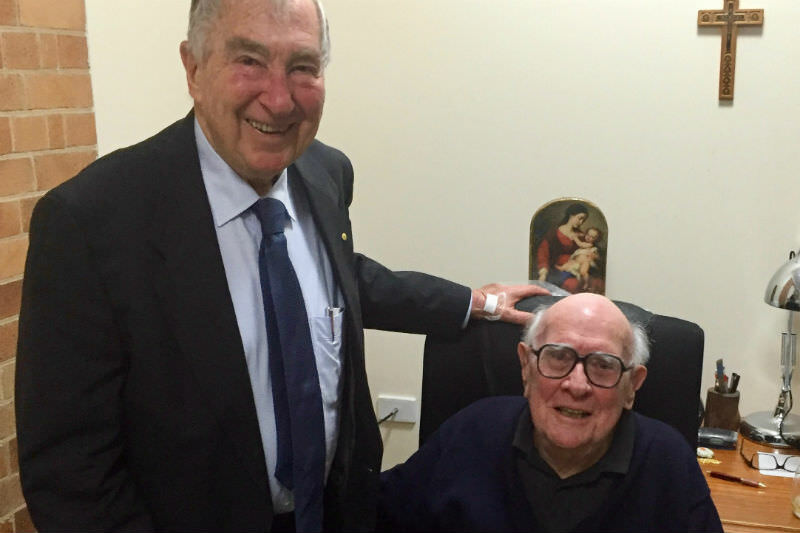 His heyday was when he was parish priest of Yeppoon just after Vatican II. That seaside oasis was buzzing with Grove's enthusiasm for the reforms of the Vatican Council. Curates like Danny Moore thrived on Grove's leadership. In these last years, Grove loved celebrating the morning mass at The Range Village with his fellow residents. Grove also spent many years of priestly ministry in Sydney, first on his return from studies in Rome and Louvain, and then in later years when he taught Liturgy at Manly seminary, was rector of the seminary, and then Director of Catholic Mission while assisting John Walsh in the parish of Rose Bay and John Usher at Mortlake. Grove was one of the great optimists in life. Despite the odds and all he experienced in the Church and world, he was often heard proclaiming that all manner of things were 'marvellous'. He brought joy to countless children with his magic jumping rabbit constructed with nothing more than a handkerchief and a slight of hand. He opened the minds of the future Galligan professors driving them through the Queensland University campus to give them a sense of something beyond farm life and the rugby field. He was one of the great enthusiasts who brought joy and expanded vision to many, particularly in parish life immediately after Vatican II. He always kept a portrait of John XXIII on his wall. When I was thinking about joining the Jesuits, I was preparing for my fourth year law exams. Grove had driven from Rocky to Brisbane staying with his beloved cousin Gerard and wife Patricia as he usually did. Hearing of my intentions, he insisted on taking me to dinner at the Milano, his favourite Italian haunt in Brisbane. I protested that I needed to study. Grove retorted, 'Nonsense, there are always law exams to be done. You only once decide to join the Jesuits. We're going to dinner.' I still have no idea how I passed that Equity exam next day. Fortunately there were no random breath tests at law exams. When I was ordained 32 years ago, Grove presented me with a new black leather bound Jerusalem Bible and a note in that perfect and distinctive handwriting. The note as you would expect of Grove was full of flattery; it exuded joy, optimism, enthusiasm and hope. Usually it would be bad form for the recipient to share such a note, and definitely not the done thing for an Australian male. But today I can because as you would expect, the note speaks more accurately about Grove than it does about me. What it says about me is impossibly idealistic, laudatory overstatement, and you'll pick it for that. What it reveals about Grove is the thoroughly humane and loving priest he was. He was never too hung up on the big political or theological controversies of the day. His interest was always in the daily realities of the other person. He had unbounded optimism that all that really mattered would be well and that hope would triumph over adversity, even in the midst of suffering, diminishment and death. Let me share most of the note from my ordination day. I omit only that which is so completely over the top as to be unrepeatable in any circumstances. What memories flood to mind! Since that day you have been part of my life and with mounting joy and pride I have noted your growth and development through various stages — the serious baby I can still see in your mother's arms at the Moggill Road home, the infant I sang back to sleep with an Italian love song in a flat in North Sydney, the child who wanted the world to know cars and trains and particularly aeroplanes were 'sheens', the boy of loveable quality who welcomed one by one a fleet of siblings, the youth whose scrabble mastery was one small sign of exceptional quality, the undergraduate so swiftly wise in the ways of the world, the graduate who noticed Jesus' gaze on him and heard him say, 'Come, follow me' and who responded unconditionally, the novice and scholastic and theologian whose company I enjoyed on countless occasions in Sydney and Melbourne and whose perspectives were widening, sensitivities intensifying and self-giving reaching heroic heights as love and compassion and concern for God's chosen ones, the most often neglected, came to dominate your thinking and shape a unique priestly character. What credit you reflect today on your magnificent parents whose goodness and steadfastness have ever challenged you to reach for the heights, not to surpass them but to reach them. Ed Campion said on learning of Grove's passing: 'He kept the faith through thick and thin. A good man gone to his reward.' Jesuit Michael Kelly described Grove as 'a wise and forgiving pastor, completely at home with life's and the Church's complexities and tragedies, from whom I learnt a very big lesson soon after I met him over 40 years ago: that tragedy is at the heart of life and what gives shape to faith. That's why he was an optimist.' His most ambitious seminarian Tony Abbott said: 'Grove had a wonderful way to uplift people and make the world seem better than it mostly is.' Bishop Bill Wright who was his vice rector at Manly Seminary says Grove was one of the great influences on his life. Archbishop Mark Coleridge spoke of 'a long life of remarkable service of the church ..a great character and a great priest'. 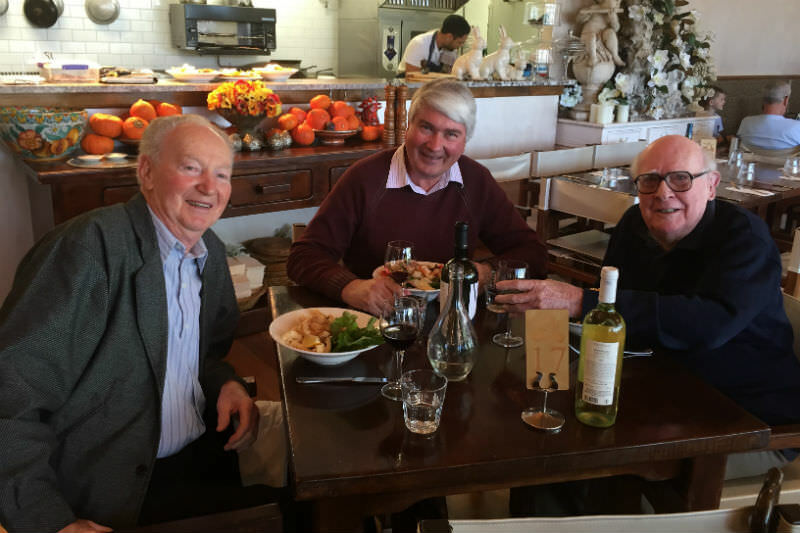 Bishop David Cremin has fond memories of arriving in Sydney from Dublin in 1955 and meeting with young priests at St Benedict's Broadway like Grove and Roger Pryke. David describes Grove as 'a champion priest'. Mick Kelly is fond of telling the story about Grove discussing Vatican II. 'Michael, do you know the two subjects Paul VI would not have discussed by the bishops on the floor of the Second Vatican Council?' 'No Grove,' responded Kelly. 'I was nine when the Council opened and about to turn 13 soon after it ended.' 'Contraception and clerical celibacy', said Grove, adding, 'And what are the two issues that have bedevilled the Church for forty years?' Pleading ignorance, Kelly asked for enlightenment. Grove answered his own question, 'Female anatomy and the nature of ministry'. Grove never lost any sleep over the controversies of the Age — whether of church or state. He had an enduring faith in European culture and in the Catholic Church. Following the unwarranted sacking of Bishop Bill Morris, he urged upon me the wisdom of John Henry Newman who wrote in The Idea of a University: 'Thank (the Church) that she has kept the faith safe for so many generations, and do your part in helping her to transmit it to generations after you.' Grove used delight in Galileo's observation that no matter what the pope might say, the earth still moved — it still rotated around the sun. We do not need to weep for Grove. He has lived a wonderful life, and he is now enjoying the eternal reward for which he prayed each day. To quote Paul's Letter to the Romans: 'For if we have been united with him in a death like his, we will certainly also be united with him in a resurrection like his.' Or to quote Grove more simply: 'there is only one goal: AD SUBLIMIA'. Grove, we have no doubt that heaven will be absolutely marvellous, with you, Muriel and Win sharing the finest food and wines with Lil who can now see all things new. And Danny Moore will be there telling you it's just like Yeppoon but with an Irish and Italian flourish. We thank you for your life of priestly service and pray that you rest in peace sublimely. Amen. 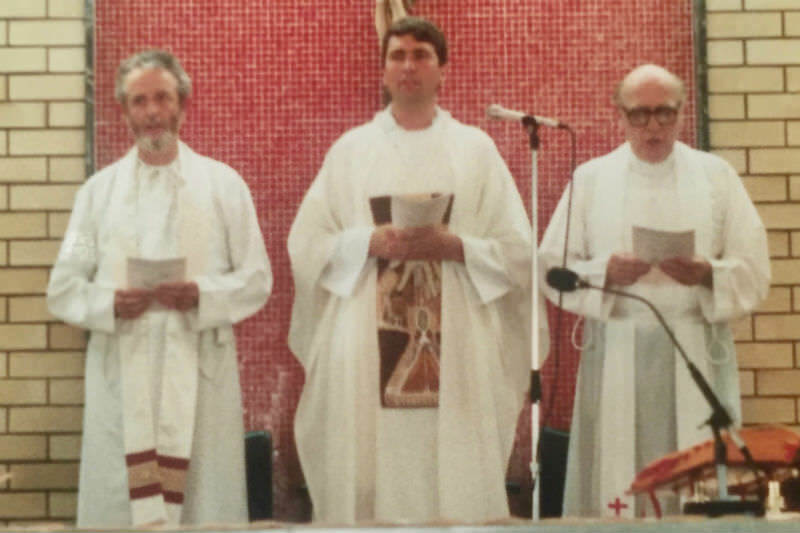 Images, from top: Grove Johnson (right) with his cousin Gerard Brennan; Grove Johnson (right) with Tom O'Hara (left) and Frank Brennan at Frank's ordination; Grove Johnson (right) with his curate Danny Moore (left) and Frank Brennan. Thank you, Frank, for this illuminating tribute to a fine priest - men like Grove Johnson evince respect and affection for the calling to which they have dedicated their lives.